Geneva / Stuttgart. 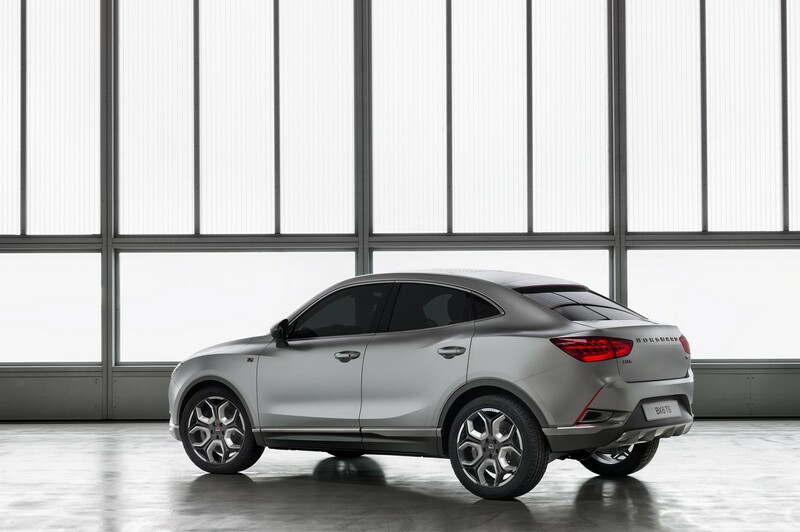 One is called the BORGWARD BX5 and combines passion with pragmatism to inject a fresh breeze into the market segment for compact SUVs—a segment that is steadily becoming the most popular and successful sector in the whole of the automobile market. The other is a show car that we call the BORGWARD PROJEKT BX6 TS. With its strikingly dynamic looks and distinctive, coupé-like lines, this SUV sport saloon will spearhead our assault on the established circle of SUV coupés. As Ulrich Walker, CEO of BORGWARD Group AG, Germany, explains: “We’re capitalizing on the momentum of our young but already celebrated brand and continuously evolving our SUV range.” Alongside the newly unveiled BORGWARD BX5 and BX6 TS, the spotlight in Geneva also falls on the BORGWARD BX7, which was unveiled last year at the IAA International Motor Show. “This spring we will be celebrating our market launch in China with our premium model, the BX7. Market launch in Germany and Europe will follow in the coming year. Following the same pattern, we will be then launching over the coming years, first of all, our compact SUV, the BX5, and then, at a later date, the series version of the BX6 show car,” says Walker. 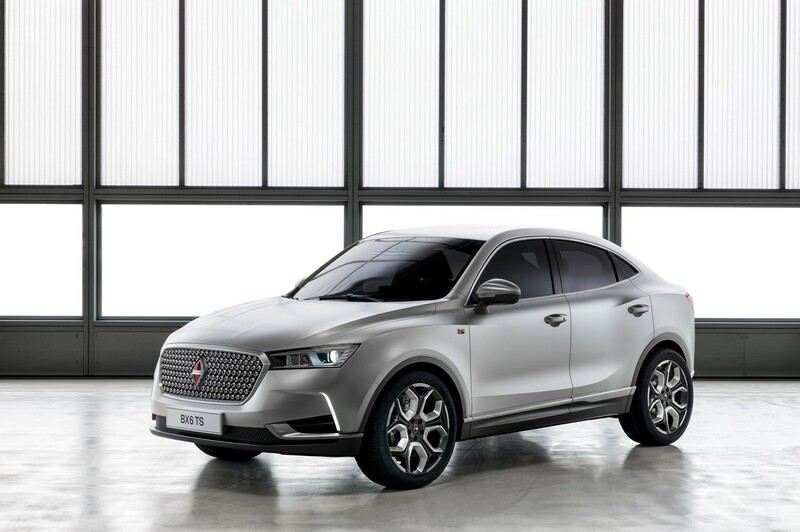 The BORGWARD BX5, which is making its debut in Geneva, is a prototype approaching the series-production stage. Measuring 4.48 metres in length and with a wheelbase of 2.68 metres, it features equipment based largely on mass-production technology and a plug-in hybrid (PIH) drive system combined with all-wheel drive. It embodies classic SUV qualities such as versatility, spaciousness, comfort and off-road capability, combining these with the outstandingly low fuel consumption and CO2 emissions of a pioneering plug-in hybrid (PIH) drive concept. This is in line with the company’s strategy of pushing ahead with the electrification of the powertrain. All production series for European launch will include a model with either a PIH or a purely electric drive system that delivers a range of 250 kilometres with minimized recharging times. 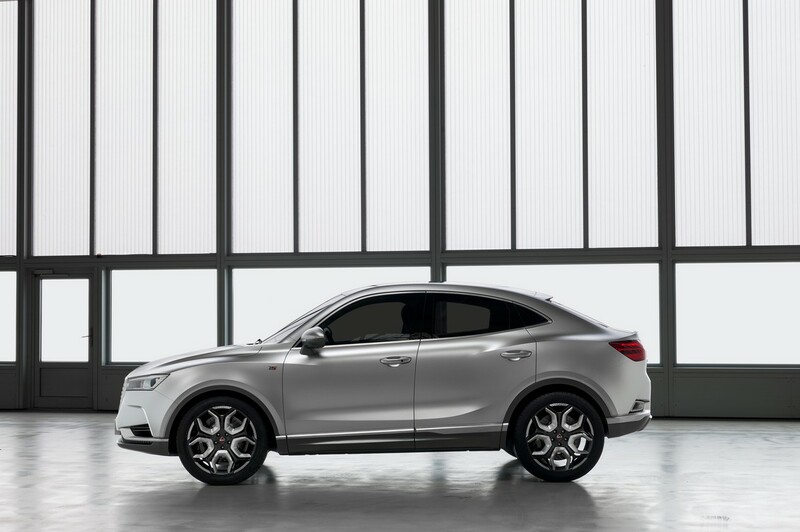 At the other end of the spectrum is the 4.51-metre-long BORGWARD PROJEKT BX6 TS, with its coupé-like roof line. 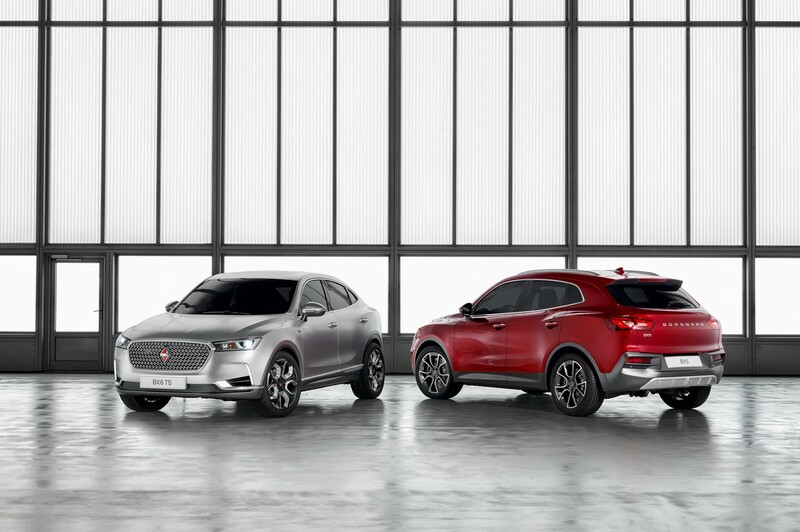 As a PROJEKT vehicle—the title to be given to all future show cars from BORGWARD—it underscores the capabilities of the BORGWARD SUV range in terms of muscular performance and agile and dynamic handling. Providing the requisite power is an extremely sporty, performance-enhanced, plug-in hybrid drive system that marries the raw horsepower of a turbocharged 200 kW (272 hp) four-cylinder engine to the beefy torque of an electric motor. Combined with the same electronic AWD system as fitted in the BORGWARD BX5, this delivers a highly impressive driving performance coupled with remarkably good fuel economy. What’s more, excellent road holding is also guaranteed even when the BX6 TS is driven hard. Thanks to a package that combines fully variable and electronically controlled all-wheel drive with a sport chassis complete with amplitude-dependent shock absorbers, a lavishly dimensioned sports braking system, highly responsive and direct electric power steering and the very latest vehicle-dynamics control systems set up for agile handling, the BX6 TS delivers a classic coupé-like driving experience offering maximum enjoyment coupled with reassuring road stability. Featuring bumpers with slits at the side that incorporate daytime running lights at the front and fog lamps at the rear plus trim of brushed aluminium, the PROJEKT BX6 TS is unmistakeably a representative of the luxurious Touring Sport equipment line. As in the 1950s, the TS line will form an integral part of the BORGWARD equipment range. The hallmark insignia of a TS model include not only the aforementioned bumpers with slits at the side, the diamond-pattern chrome lattice of the OCTAGON radiator grille and, as its centrepiece a chrome diamond BORGWARD badge with red inlays, but also specially designed alloy wheels, bumpers painted in the vehicle body colour and decorative trim in brushed aluminium. The bumpers, door sills, window mountings, door handles and wing mirrors all boast decorative elements in matte aluminium. The rear hatch is adorned with the TS logo in a chrome-red combination. Equipped with the very latest in plug-in hybrid technology, both the BX5 and the PROJEKT BX6 TS deliver an outstanding performance combined with extremely low fuel consumption and emissions. The powertrain of the multitalented BX5 is largely the same as that installed in the larger BX7, which celebrated its world premiere at last year’s IAA International Motor Show. It comprises a turbocharged, direct-injection, 1.4-litre, four-cylinder engine delivering 105kW (143 hp) together with an 85 kW (115 hp) electric motor. The range under electric power is 55 kilometres. The four-cylinder engine drives the front axle via a seven-speed dual-clutch transmission. Powering the rear axle is an electric motor with integrated kinetic energy recovery system (KERS), linked to the front drive unit via a sophisticated control system. This intelligent AWD system applies torque to the electric rear axle by means of a “virtual drive shaft”, whenever the demands of energy efficiency, handling dynamics or driving safety require. At the same time, during deceleration or braking, the system regenerates kinetic energy, with which to recharge the batteries. The BORGWARD PROJEKT BX6 TS is a completely different character. This model showcases the performance potential of the BORGWARD concept. Here, too, developers have opted for a turbocharged, direct-injection, four-cylinder engine—this time, however, with 2.0-litre capacity and power of 200 kW (240 hp). This, in turn, is coupled with a performance-enhanced electric motor delivering 110 kW (150 hp). If required, the combined muscle of these two power packs will deliver vigorous acceleration and propel the PROJEKT BX6 TS to the performance level of a highly tuned sports car. On the other hand, it is also perfectly capable of meeting the demands of a modest fuel economy when driven in the E-Cruising mode. In fact, the plug-in hybrid features a choice of eight different driving modes. These are activated either automatically or manually, via the push/turn controller on the central console, and are displayed as activated in the media touchscreen and cockpit display. In addition to standard plug-in hybrid driving modes such as energy recuperation, pure electrical power and boost, the multitalented BORGWARD BX 5 also features an off-road program to increase performance on challenging terrain. Intelligent driving strategies in combination with GPS navigation, online services and individual driving style enable a further increase in efficiency. This ensures that the energy from the lithium ion battery is converted into a maximum driving range.